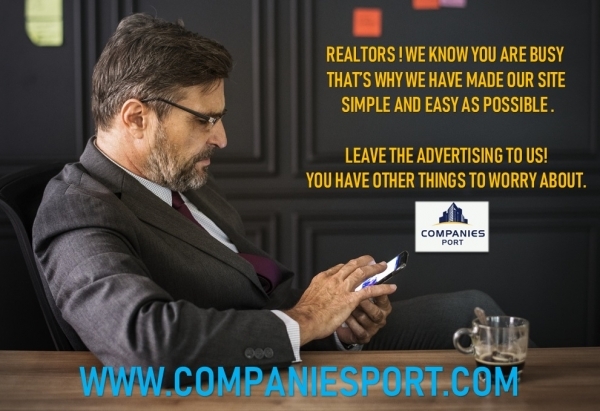 We would like to introduce you to our Online Advertising Platform “www.companiesport.com” which will allow Realtors, Businesses & Companies to advertise for Selling, Buying & Franchising of various Businesses. Our specialization is in Commercial Real Estate mainly in Canada & USA and now extending our services to Europe and other major countries .Register online today and take advantage of 30 Days Complimentary Worldwide Advertisement. Let us know if we can publish your Listings and business information on our website. Our mission is to help you get recognized and get connected to a Global Audience. If you have any questions or feedback relating to our services, please contact me at 416-546-8881 . Thank you for your time. Have a great day !